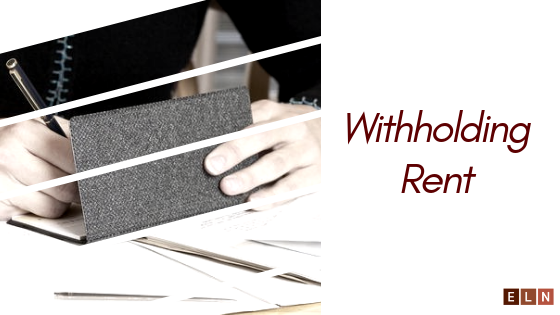 Withholding Rent - The Law Offices Of Eric L. Nesbitt, P.C. Colorado landlord/tenant law was designed to protect both landlords and tenants who engage in a deal. While the initial purpose of the rental is presumably for the benefit of both parties, misunderstandings, disputes, and the like can and do occur. One party may not be living up to its obligations. With this in mind, the Colorado legislature created a body of law that addresses these and other issues when a landlord and tenant are involved. Many of these laws are found in the Warrant of Habitability Act from 2008. According to the U.S. census, there are approximately 500,000 people in Colorado who rent. This is equal to around 32% of the population. As such, Colorado landlord/tenant law covers a significant number of residents. A major portion of the law deals with situations wherein one party has a grievance against the other party and remedies for such grievances. One such tenant remedy is to withhold rent. Provided that the circumstances are correct and the qualifications have been satisfied, a tenant may legally withhold rent and the landlord has no legal right to evict the withholding tenant. These deficiencies must be materially adverse or unhealthy. A tenant must supply the landlord with written notice to trigger a legal remedy. If supplied in writing, the landlord must repair the rental unit in a “reasonable” time. if not remedied, the tenant can withhold rent. An issue that arises is when the house contains lead paint and presents a hazard to the tenant. Prior to 1978, it was common for interior paint to be lead-based paint. When the lead paint chips and when there is dust from the paint then the tenant faces a health hazard. Depending on the circumstances, the tenant may be allowed to withhold rent until the hazard is removed. In general, it is the landlord’s duty to maintain the apartment in good shape. However, if there is peeling paint and chips then a tenant should call the health department to inspect the premises and draft a report. It is the landlord’s duty to inform the tenant about any lead on the premises. For questions about landlord/tenant law or other real estate legal needs in Colorado, contact the Law Offices of Eric L. Nesbitt, P.C. at 303-741-2354 or Info@NesbittLawOffices.com.